Seven years ago, Domino’s Pizza was in the pits. Tasteless, unexciting food and an all-time low in its share price, the company also ranked last in a 2009 survey of consumer taste preferences. The only silver lining: they scored top marks for delivery and value. Just a few short years later, Domino’s has recaptured the hearts of its customers, and its investors. Now the second-largest pizza chain in the world, its share price has soared from its bottom-of-the-barrel price of $8 in 2009 to more than $160 a share in December, 2016. Today, the company considers itself a tech firm as much as a pizza maker, with digital futurists making up half the workforce in its Ann Arbor headquarters. Talk about value creation. What happened? A focus on customers is what happened - as well as the recognition that digital technology in its many forms is a key driver of virtually all customer experiences today. Their new CEO, J. Patrick Doyle, executed against his vision by embracing customer experience as a core strategy, and enabling the delivery of that experience by becoming a disruptive technology company. After all, Domino’s was more than a company that just made pizzas; it delivered them, too. With this insight, the company recognized that IT — along with CX — was the key to turning things around. There are a bunch of lessons we can learn from this turnaround. If you embrace these four, you might be on track to creating a digital disruption success story of your own…. Domino’s HQ employees also read the scathing criticism aloud. With comments such as “a crust like cardboard,” and “totally void of flavor” printed on sheets of paper, the wounded pride of company chefs and other workers was evident. The campaign invited customers to follow Domino’s “pizza turnaround.” With customer comments taped to kitchen walls, workers experimented on a new recipe. By facing consumer criticism head-on and using it to better understand the needs of its customers, the results— a new pizza recipe and revamped menu, for starters — helped change attitudes toward their brand. Domino’s hasn’t stopped nurturing customer relationships. This month, the company announced an initiative to give loyal fans an opportunity to win Domino’s stock. And rewards members can try out for a $10,000 prize through posting photos on social media. And more. In “Smart Customers, Stupid Companies,” the book I co-authored with Bruce Kasanoff, we defined Social Influence as the impact that social networks have on the dynamic between customer and company. It means that the opinions and experiences of countless other people get thrown into the mix, radically changing the customer relationship lifecycle. In the past, when a company engaged with a customer, few other parties would be involved. Today, that’s no longer the case. Social networks create an environment in which customers are talking to other people, asking questions, and learning from their digital peers. At the same time, customers are interacting with the company. As it encouraged consumers to try the new recipe and leave feedback on social media, the company showcased the comments with a live Twitter feed on its Pizza Turnaround microsite. The company also displayed comments on related blog posts that covered the campaign, including one podcast interview with Doyle on Oprah Radio. Harnessing the power of Social Influence, Domino’s even reached out publicly to food bloggers who had previously criticized their pizza’s taste, asking them to give the new recipe a try. In all aspects of the turnaround, Domino’s Pizza got it right because they recognized the value of transparency. It didn’t hide from dissatisfied customers, but brought them and their people into the process at numerous stages. The Pizza Turnaround ad campaign - Domino’s put the spotlight on negative customer comments. No secrets, no spin. It radically embraced the truth. The Pizza Tracker App – Kind of like Uber for pizza, a live tracker app lets customers follow each stage of their order. From placement to cooking to leaving the store, the pizza making process is documented in real time. And there’ a GPS feature to track the driver’s location. CX, customer and other key metrics - Domino’s stores feature a monitor that details key stats such as weekly customer counts, amount spent per order, and how each franchise ranks compared to other stores. Employees see these stats to learn how well they’re doing in real time. There are more examples, of course. But the point is, in the world we compete in today, there is little tolerance for anything but the truth. And if customers can’t get it from you, they’ll get it from each other. And they’ll use it to reframe your brand, whether you like it or not. Lesson 4: They improved existing – and designed new – experiences, based on their customer’s needs. In its early years, Domino’s built its reputation with a timely delivery service. Transportation (getting pizza from point A to point B) has always been a part of the business. But despite its top ranking in this area, they needed something more to align with the ‘new’ Domino’s. Four years in the making, the car includes a warming oven, a level floor, and a console that holds salad, sides, and sodas. The car has just one seat and has room for 80 pizzas. A cool, functional, advertisement on wheels, Adweek heralded it as “a cheese lover’s Batmobile.” There are now more than 100 DXPs in cities such as Boston, Detroit, New Orleans, and Seattle. 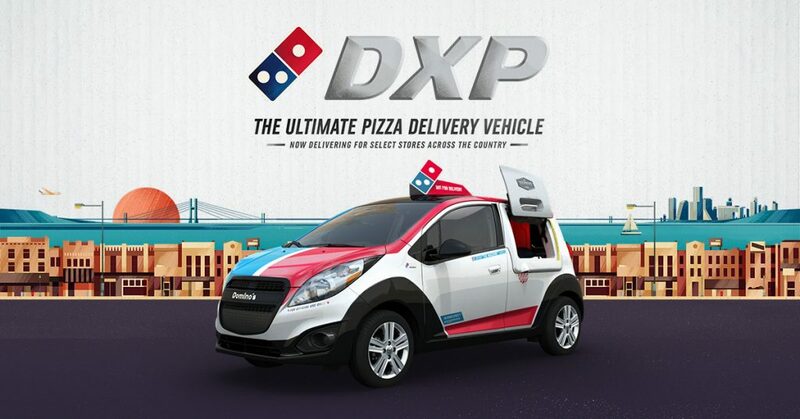 The company remains the leader in pizza delivery today, and is poised to be the pizza delivery leader of the future. A partnership with Ford Motors lets customers order pizza from the control panel of a car. And they’re experimenting with other hi-tech platforms such as robot and drone delivery. Soon, pepperoni may be raining from the sky. The lessons from Domino’s success story can help your company in many ways. They can turn a company around, accelerate growth for leaders, and fuel the explosive growth of a startup. Chances are, your competition is already taking action using some of these examples. Certainly, leaders in every market are embracing customer experience management, and most are looking to digital innovation as the way to deliver it – just as Dominos has done. Enjoy!